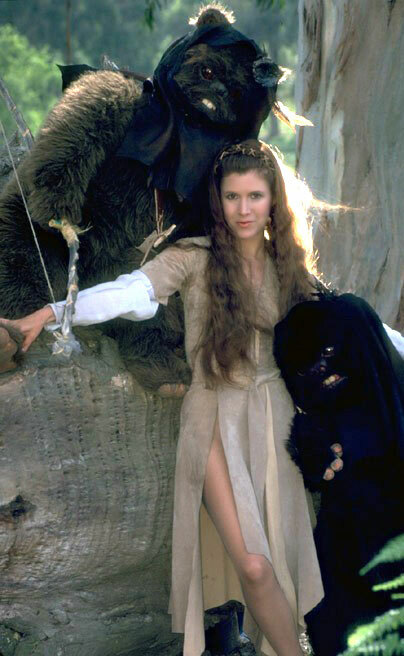 The dress that Leia wears in the Return of the Jedi while at the Ewok village is her simplest outfit, (follow link to see an image of the dress). The majority of the dress is made out of chamois leather with a blouse underneath made out of crepe, (I’d venture to say silk crepe). Chamois leather is soft leather made from goat or sheep; it is a very soft leather and comfortable leather. Crepe is a kind of fabric, more a texture than anything else, it can be made out of many different kinds’ fibers, but for Leia, I’d say a crepe silk would be the best bet. Much of the fabric used in Leia’s wardrobe is silk so it goes to reason that the blouse used in Return of the Jedi would not be an exception. The stitching that was done to put Leia’s Ewok village dress together can be see under the decorative chamois leather lacing done over the top on many, but not all, of the seems of the dress.